New supervillain Infearno includes some minifigure parts and accessories that deserve special mention. The Tr. Bright Orange [TLG]/Trans-Orange [BL] Flame Head Piece (Element ID 6076535 | Design ID 15404) has been highly anticipated by Super Heroes fans since it seems like a perfect fit for characters like the Human Torch or Ghost Rider. It also looks like it could have great versatility as a building element, perhaps as fiery exhaust from a rocket. 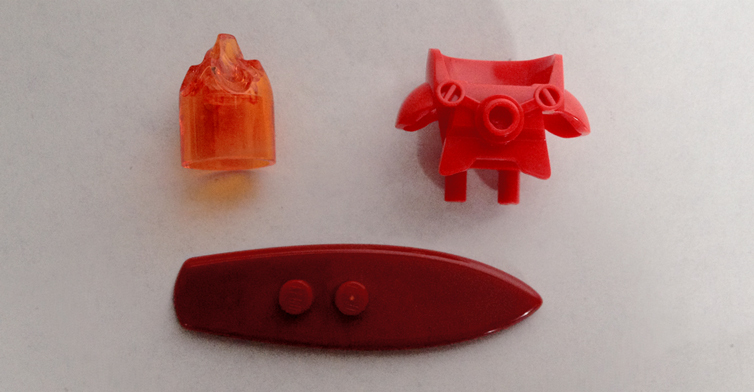 The Mini Space Marine Armor also appears for the first time without printing in a versatile Bright Red [TLG]/Red [BL] (Element ID 6081974 | Design ID 72326). 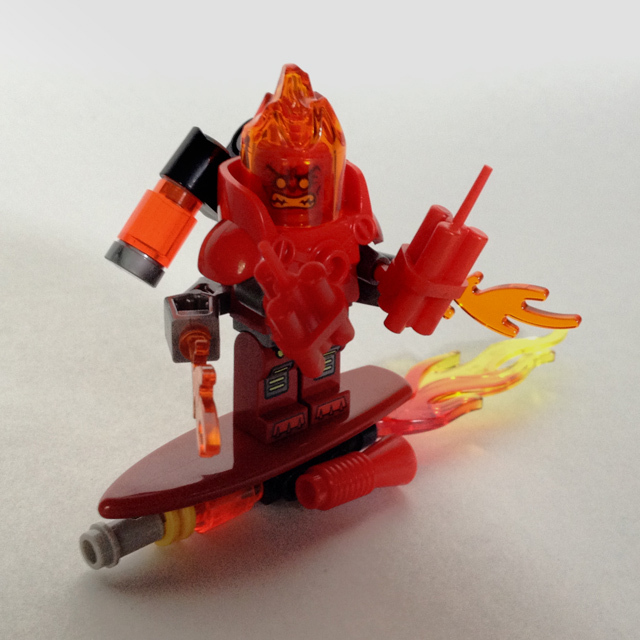 His hover board uses a Surf Board W. Knob, appearing in New Dark Red [TLG]/Dark Red [BL] (Element ID 6083150 | Design ID 17947) for the first time. 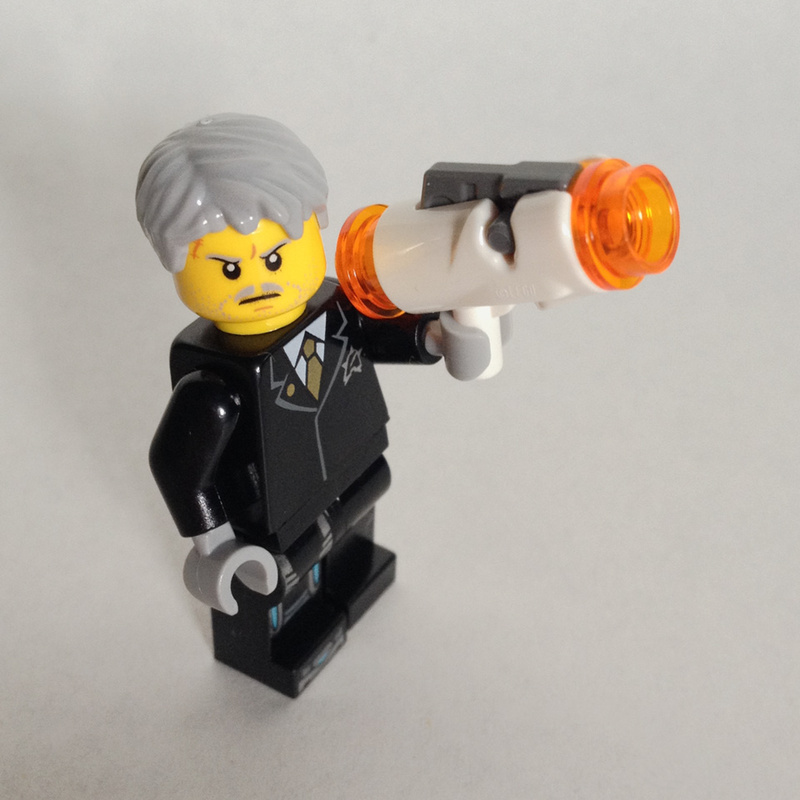 This year’s new Mini Shooter with Ø3.2 Shaft (Element ID 6076599 | Design ID 15391), discussed extensively in Tim J’s 70802 review, appears in White for the first time in the Ultra Agents theme, though it appears in all six sets. It’s not the most useful color for a gritty military look, but it looks quite nice as a sci-fi weapon. And let’s be real: the color is hardly this piece’s only difference from real-world firearms. This is my first set with one of these launchers, and I think they function brilliantly. Props to the designers and engineers who made them possible! 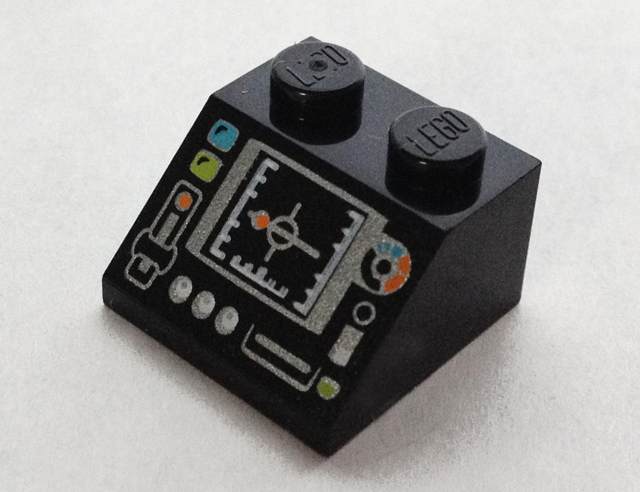 Other than minifigure parts, the set does boast one other new printed element: a 2X2/45° Roof Tile with an exclusive targeting computer pattern (Element ID 6083346 | Design ID 18433). The simplicity of the pattern feels much like computer terminal slopes from past decades, though modernized with flashy silver printing. The LEGO Group introduced the color Silver Metallic [TLG]/Flat Silver [BL] back in late 2010, and by 2011 it completely replaced the earlier Silver [TLG]/Pearl Light Gray [BL]. It’s probably one of the LEGO Group’s best “pearl” silver colors, with a smooth, consistent value. This set introduces some useful new parts in this color: the two 1X4 Bricks with Bow (Element ID 6078607 | Design ID 11153) and three 2X2 Plates with Bow (Element ID 6083508 | Design ID 15068) are exclusive to this set, while the two 2X2 Motors (Element ID 6076604 | Design ID 50943) appear only in this and 70165 Ultra Agents Mission HQ . The 56mm Corrugated Pipe (Element ID 6083456 | Design ID 57719) last appeared in Silver back in 2008, so naturally the two in this set mark its first appearance in Silver Metallic. 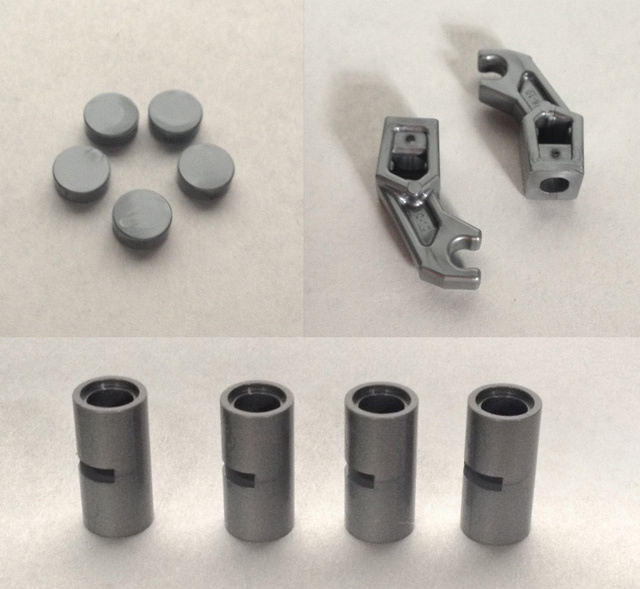 More common Silver Metallic parts in this set include four 1X1 round tiles (five, counting the usual extra), two robot arms, and four Technic tubes. Some people prefer lacquered metallic colors like Silver Ink [TLG]/Metallic Silver [BL] to pearl metallic colors like this, but I find the pearl colors more “LEGO-ish”. Perhaps that’s my history as a BIONICLE fan speaking, since it was one of the first themes to make copious use of pearl colors. The interceptor itself includes some beautiful new Tr. Light Blue elements. Appearing for the first time in this color are the 4X8X2 Cockpit (Element ID 6078608 | Design ID 92579) and four Ø48 Parabolic Reflectors (Element ID 6081809 | Design ID 30234). 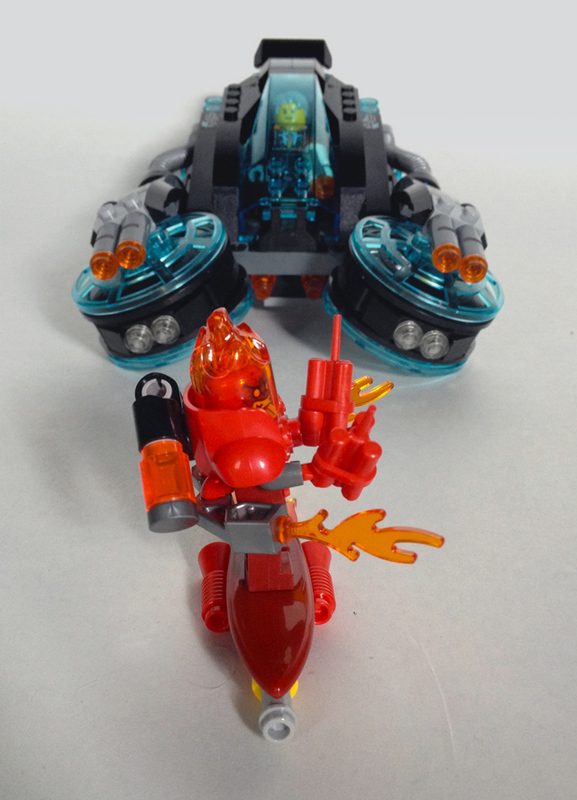 Both are currently still exclusive to this set, but the cockpit glass in particular might have plenty of use in this color in future sets. Also new and rare in Tr. Light Blue are the four (six, counting extras) 1X1 Roof Tiles or “Cheese Slopes”. They also appear in the Speedorz set 70151 Frozen Spikes. Previous sets have used either Tr. Blue [TLG]/Trans-Dark Blue [BL] or Tr. Fluore. Blue [TLG]/Trans-Medium Blue [BL], but having them in this additional blue color could still be incredibly useful in certain applications. More common in Tr. Light Blue, but still useful, are the set’s thirteen 1X2 plates and eight (nine, counting extras) 1X1 Round Tiles. 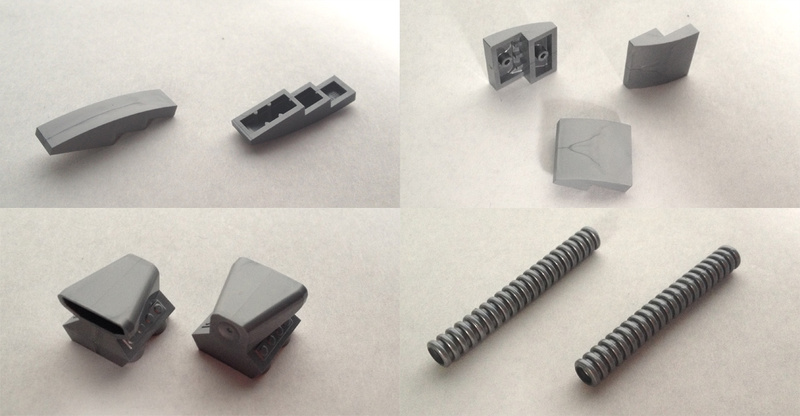 The new 1X4 Spring Shooter (Element ID 6048898 | Design ID 15400) has appeared in 28 sets since it came out earlier this year, not counting co-packs. But it still deserves special mention here since this is one of just three sets to include the 8M Arrow for Spring Shooter in Tr. Bright Orange. This set includes two shooters and three arrows. The function is brilliant, with great power, range, and accuracy. As a bonus, you can load the arrows into the launcher in either direction. The only disadvantage is that it’s very easy to fire the arrows by mistake. 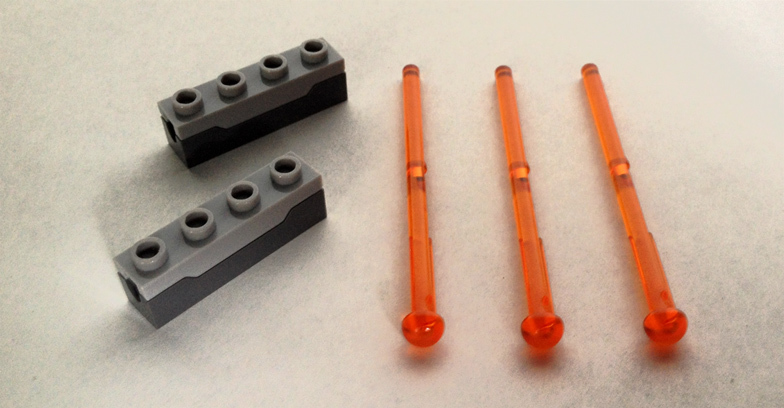 Thankfully, the shooters in this set can fold down into a safe, concealed position (see picture below) where they can’t fire by mistake, but on sets like 70816 you might want to remove the arrows when you’re not using them. This set boasts a few new and rare Technic elements. In Dark Stone Grey [TLG]/Dark Bluish Gray [BL] it boasts two copies of a new design for this summer, 2X2 Inverted Plate with 2 Snaps (Element ID 6066952 | Design ID 15092). Five other sets released this summer (including another I’m in the process of reviewing…) include this same part, but even the two in this set should allow for lots of new building opportunities. Another new design is the Black 2M Single Bush (Element ID 6073231 | Design ID 15100), which was discussed in this site’s earlier Speedorz review. This set includes four of these. Finally, this is one of just two sets to include a Toggle Joint in Bright Blue [TLG]/Blue [BL] (Element ID 6061202 | Design ID 32126). 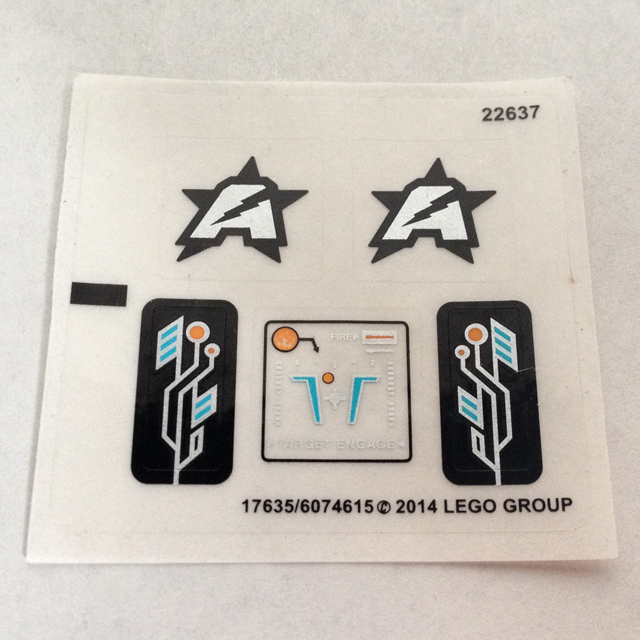 The sticker sheet is small but stylish, with two Ultra Agents/Astor City logos, a head-up display for the cockpit glass, and two circuit board patterns for the 1X10 bricks with bows. All this is printed on clear film, which I don’t entirely like since it shows dust, fingerprints, and bubbles, but this is a necessity since three of the stickers are supposed to have backgrounds that match the transparent or metallic parts they are applied to. And mercifully, the other two stickers are entirely printed with black backgrounds so the transparent film becomes a non-issue. I’ve chosen to apply all of them, as I normally do with my sets. But the set is beautiful with or without them. 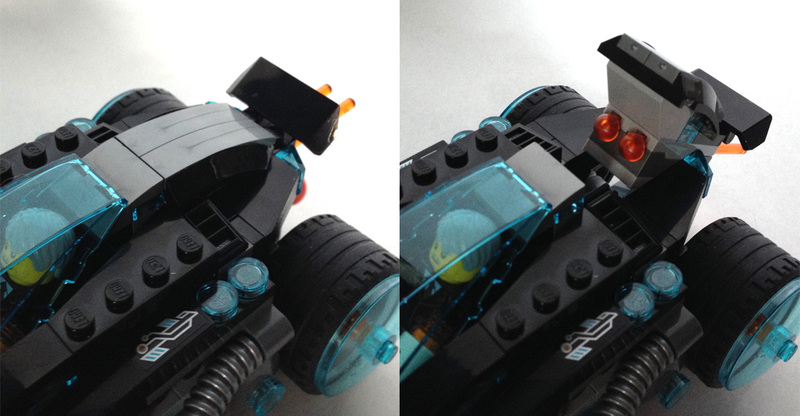 The first numbered bag includes the parts to build the minifigures, Infearno’s hoverboard, and the boxy “cab” of the main vehicle (including the ejector seat function). The second numbered bag adds the wheels, launchers, and other details. Infearno’s hover board is obviously much smaller than the main vehicle. It’s very swooshable, and looks somewhat cobbled-together with its many colors. This was clearly a conscious choice, since the designers used a Bright Yellow [TLG]/Yellow [BL] Technic half-bushing instead of a Medium Stone Grey one like those used elsewhere in the set. To even the odds, Infearno is equipped with two bundles of dynamite and two flamethrowers clipped to his back. The “mission” highlighted on the box is retrieving the glowing fuel canisters on his back, but it’s not clear whether this is because they are valuable or simply because they are extremely dangerous in the hands of a pyromaniac supervillain (they are not mentioned in the official product description, and I can’t find mention of them on the Ultra Agents website unless they are described in a game or video). The main vehicle is a work of art, with colors and motifs that evoke the light cycles of TRON and a shape that resembles the Spinners from the movie Blade Runner (to my regret, I have not seen either movie — I’ll turn in my nerd card when I leave). It transforms from a rolling “street mode” to a flying “hover mode” by hinging the rear wheels down and the front wheels up, though thanks to the angle of the wheels it can still roll even when in hover mode. It would be cool if the four hinged wheel hubs were linked, but this is probably not possible on a set this size, so each wheel hub hinges independently. The concealed arrow shooters are both stylish and effective, as is the ejector seat (it became jammed when I first finished building the set, but this was easily remedied by pulling the interior walls apart very slightly — apparently they had caved in slightly during the build process). 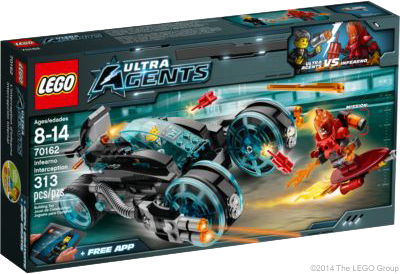 On the whole, the Ultra Agents theme is not my cup of tea — I generally prefer the more modern-looking designs of the 2008 Agents theme to this expressly futuristic take, where the high-tech nature of the vehicles is not the least bit covert. Only in a world where everyone drives a car like this would it not stand out as state-of-the-art spy gear. But when offered the chance to review sets for New Elementary, I jumped at the chance to review this set, not only because it is a treasure trove of fantastic parts but also because it’s generally an amazingly well-polished design. I am proud to consider it a part of my collection and do not expect to scrap it for parts any time soon, even with so many beautiful parts staring me in the face! 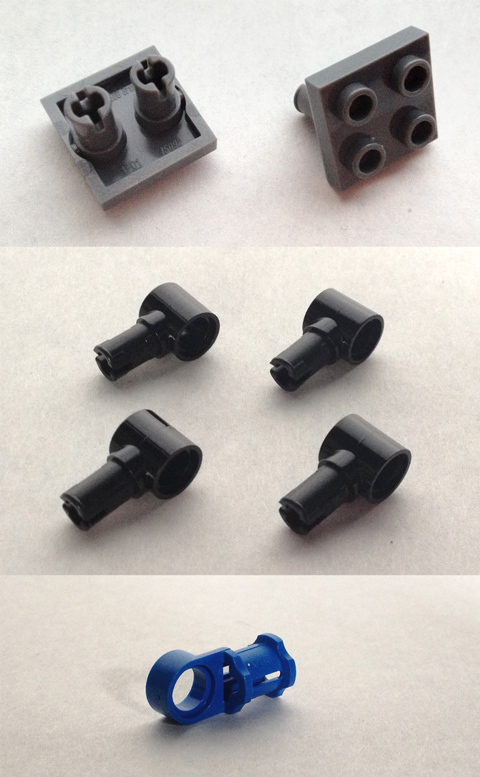 But if you are looking for a parts pack, this set definitely fits the bill. Just don’t be surprised if you, too, end up falling in love with the finished model! Our thanks to LEGO's Community and Events Engagement Team for providing the set. 70162 Infearno Interception retails at US$29.99 / £24.99 / €29.99. Purchasing after following the affiliate links below will help support New Elementary! 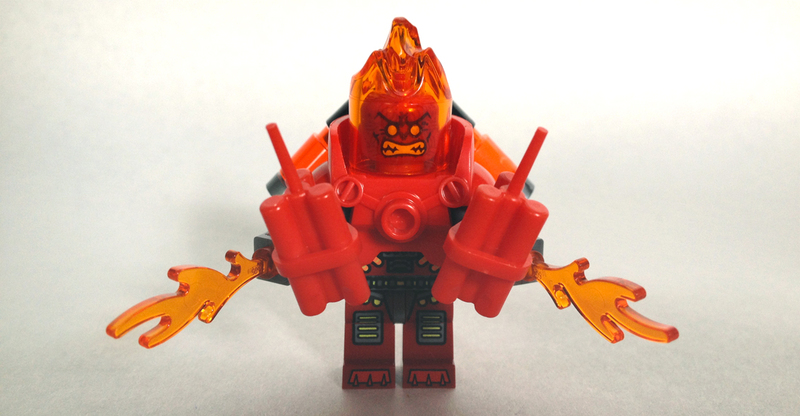 I admit I've always stopped and looked at these sets before moving on to try and find the mixels or see what HF sets are in stock. Between Ninjago, Chima, and now this theme, I'm definitely an action theme fan of lego. These kinds of themes are always the ones that interest me the most. All these sets look great. Though I haven't really heard which set is the set to get out of this series. Do you guys have a sort of consensus on which set is the best one yet? I haven't really been involved enough in discussions of this theme to know what sets other people like, but I do remember that when the sets were first revealed this one was a popular one. The Ultra Agents Mission HQ is cool, but personally I prefer the Mobile Command Center from the 2008 Agents theme, which I felt had more to offer in general (two boats, two ATVs, a plane, and a projector built from a light brick). Plus, as I mentioned in the review, the old Agents theme felt more "covert" to me. All the futuristic tech was hidden until you opened up all the flaps. Somebody who didn't get to enjoy the previous Agents theme might be able to appreciate the new Mission HQ more than me. Hurricane Heist is a mixed bag. It doesn't totally fit the aesthetic of the other sets — rather than bright colors and a campy supervillain, the vehicle and its pilot both have a grittier, militaristic look. But some people really like it because it's basically modeled after a Metal Gear (as described here). I saw this the other day and was tempted to get it, but already had my heart (and $$) set on a handful of the series 3 Mixels. Loving the new Technic pieces, and that silver metallic is becoming more prolific, not only in number produced but also in variety of pieces. Thanks Aanchir for the fantastic review, by the way. Aanchir?! Reviewing something? I never would have expected that, but for a parts blog, his encyclopedic LEGO knowledge fits right in. And it's a great review too. This one is at the top of my wanted list. Does anyone know if Marcos Bessa designed this one? It's not in his portfolio, which is largely comprehensive (http://marcosbessa28.wix.com/vintoito#!lego/ctd5). There's a "TBD 2014" there, but I doubt that's a set that's already been released. I used to review more stuff, back when I was in college. Sadly, most of those reviews were for The Ninjago Wiki (ninja.brickcraft.me), which no longer exists. It might be just as well since the photos in those reviews were sub-par compared to this one. Rest assured this won't be the last review you'll be seeing from me! Great review Aanchir! This set looks amazing, I'm thinking about picking it up myself. I need some of those Cheese Slopes! As they keep making new colors of those, I always keep buying them. New computer slopes in white, gray and black are always welcome. I could swear there was something I was working on a few months ago that could have used the 15100 connector, but I can't for the life of me remember what it would have been. Maybe it was tweaking the design of the Exo-Suit. As for Tron, I remember it was a concept that thoroughly captivated my imagination as a kid, but I was never able to actually watch the movie until several years later and even after watching both movies and all of the TV series, I find that they still haven't really done justice to it. The original movie, in particular, has some scenes that are so superfluous that I completely forgot about them until rewatching it last year (specifically the "Mos Eisley" scene with all the non-standard-shaped computer programs). There's no denying that the visuals are awesome, though. The visuals team for the movie included French cult cartoonist Jean "Moebius" Giraud. That could likely have played a part.